As a result of the current government administration and the increased desire for products made in America, were going to continue to see a sizeable infrastructure investment in the industry. Where do you see the manufacturing industry going in the short term (2-3 years), medium term (5-7) and long term (10+)? Short Term- As a result of the current government administration and the increased desire for products made in America, we’re going to continue to see a sizeable infrastructure investment in the industry. This investment will range from technology and people to marketing and building the company’s brand identity. Mid Term- Similar concept to supply and demand from a product standpoint, we expect there to be a limited supply of truly skilled and an educated workforce. A short supply of an experienced skilled workforce will lead to more in-house, on the job training, which also will require additional resources and investments in their own right. Long Term- While it’s hard to predict that far in the future, we believe we’re seeing a similar cycle to that of the 60’s, where there was a significant focus on building infrastructure, i.e. highways, bridges, etc. While that era once positioned the US as a global leader in manufacturing, since then, the rest of the world has caught up. Capitalism has taken over in most countries. Therefore, while the current business trend prioritizes quality and local US production, we expect a shift in thinking, where the focus goes back to less expensive alternatives. AI, Automation, Efficient & Lean Operations, and Relationships will continue to help level the low cost labor playfield. I’ve read about your efforts to create your own design firm, I assume that’s one way you’re looking to expand your offerings to clients. Can you tell us more about what that’s all about? Design services primarily focus on manufacturability of the individual product. Each product design opportunity is unique; it is exciting to be a part of these development opportunities. Previously, a customer would require as many as three or four companies to see a product from concept to fulfillment, and thanks in large part to our knowledgeable Design and Operations team, they can now come to Aimtron for design, PC Board Assembly and HLA (High Level Assembly). When one company can do it all from start to finish, it benefits everyone involved, including the manufacturer, distributor and even the end user or customer. We are able to shorten leadtimes, providing more aggressive delivery date commitments, while simultaneously improving the overall quality of the product, while decreasing costs. This is consistent with our vision, for those we deal with, as being a “Preferred Partner” of Aimtron. We can simplify the whole process, saving time and money. In other words, we are providing more value for less. You mention the desire to diversify, what exactly are you doing to expand into other industries? We’re not looking to diversify just for the sake of diversification. Rather we are interested in expanding into other categories while keeping a synergistic approach within our core competencies and of course our industry niche. Take for example our recent acquisition of the Target Corporation (TargetCorporation.com), this was a move to expand our production and service capabilities into government and military services. As a result of this acquisition we will grow our Aimtron family by nearly 20% to just under 200 employees and have a combined footprint of more than 100,000 square feet. Most importantly this positions Aimtron to offer additional services and increased capabilities to its client base, delivering the highest quality products on time and on budget, while providing Aimtron another sector to service, and to build our customer base upon. Made in America products tied to technology is pretty rare, what are you doing different than your competition as you continue to increase your revenues? Companies that are manufacturing overseas lack the ability to provide support after the shipment takes place. We provide a level of post-delivery support unlike anyone else in the industry. That’s due in large part to our commitment to our customers and also the simple fact that we believe the transaction is not over once the product is shipped, but actually years or months later as that customer becomes a “Preferred Partner” and loyal customer of Aimtron. This ability of ours all comes back to our investment in the infrastructure. We are proud to provide the best value ranging from small quantity prototypes to large volume production, delivery and post-shipment response and support. As a company we will continue to look for strategic opportunities to expand our footprint in the US. This will be through a combination of opening our own facilities on the Eastern and Western parts of the country, as well as through additional acquisitions. As long as the acquisitions fit within our core competencies. Additionally, our recent Target Corporation acquisition is fairly new, and we have big growth plans for that operation. As that acquisition is an important representation of our efforts to expand into Government and Military services, we promised to invest more in the people and technologies needed in that facility. What industries do you work with currently and what industries are you looking to get into in the near future? Future- The growth as a result of our Target Acquisition provides us with an opportunity to expand into categories such as Military, Aerospace, and Government. Additionally, Aimtron would like to get into Artificial Intelligence & Robotics. What is your vision and mission in taking this company further? As we stated above, our vision is to be the “preferred partner” of both our customers, as well as our supply chain partners. We find it meaningful in running our business, if we are easier to work with, and we invest more into our relationship with those we do business with. We take pride in the positive relationships we forge. In addition to the above, we value teamwork, integrity and courtesy above all else. Mukesh Vasani is the CEO and President of Aimtron. Born in Gujarat, India in 1964 Mr. Vasani came to the United States 22 years ago, with the American dream in mind of becoming a successful entrepreneur and business owner. With a degree in civil engineering, Vasani began his career in the US in the construction industry and quickly realized that simply wasn’t for him. Always intrigued in electronics Mukesh went back to school to receive his electronics degree from Devry Technical Institute. In 1998, Mukesh became minority owner at an electronics manufacturer company in the suburbs of Chicago that quickly grew to more than 27 million dollars in revenue in 7 years. 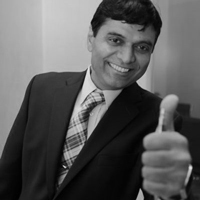 Despite the downturn in the economy in 2009, Vasani decided the time was right to start his own company as he recognized the need to create a “world class” company built on the premise of combining the ability to hire top talent and the latest technology that can benefit from a state of the art infrastructure and the best “in industry” processes. Along with his commitment to creating a family friendly atmosphere and his desire to offer the employees a good work-life balance, Vasani’s goal has always been to create a leading American made manufacturer with global distribution capabilities. As a part of social responsibility Mr. Vasani just started Aimtron Foundation which is a not for profit entity with a focus on helping our youth and other social activities. Aimtron University, a part of Aimtron Foundation is providing quick access to educational experiences by creating a bridge between the school environment to real life work.